King Mswati III, Swaziland’s absolute monarch, has appointed six members of his own family to the kingdom’s House of Assembly. This follows elections held in Swaziland (the kingdom he renamed Eswatini on his 50th birthday) on 21 September 2018. 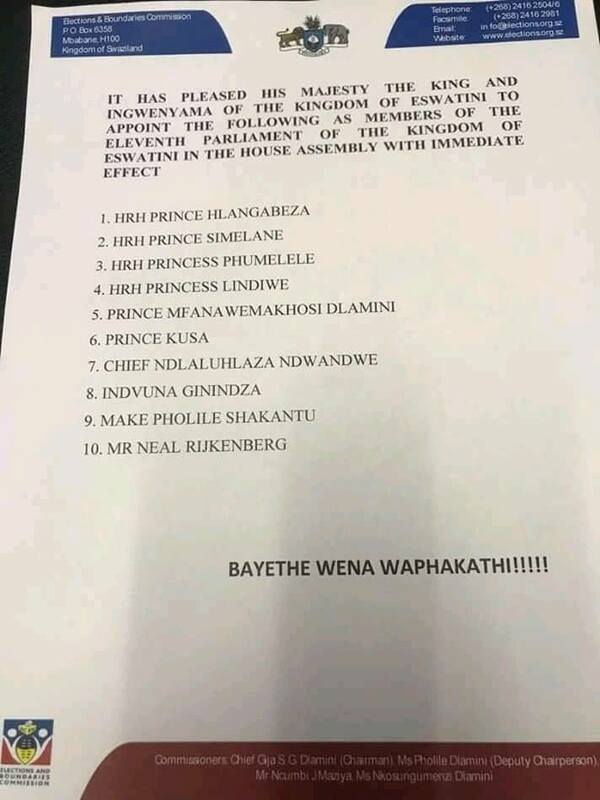 In Swaziland the people are only allowed to elect 59 members of the House of Assembly; the King appoints another 10. On Tuesday (2 October 2018) the Elections and Boundaries Commission announced that six of these would be Princes and Princesses from the Royal Family. None of the 30 members of the Swazi Senate are elected by the people. The King will appoint 20 members at a later date and 10 will be elected by the House of Assembly. The King also appoints the Prime Minister and government as well as top civil servants and judges. The move to appoint members of his own family is nothing new in Swaziland. At the previous election in 2013, King Mswati named two princes, a princess and three members of his own Dlamini clan among his 10 appointees to the House of Assembly. He also appointed six members of his family to the Senate. He then appointed another 16 members of his Royal Family to top political jobs; effectively carving up public life in the kingdom in his favour. 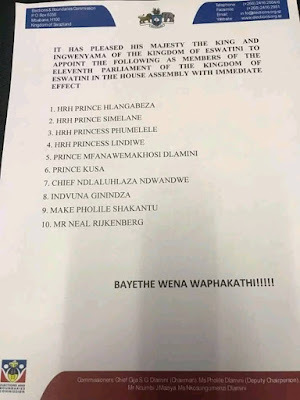 There were nine princess and princesses and a further seven from the family Dlamini in the 24-strong Liqoqo (the Swaziland National Council), the most powerful of the committees that advises the King. There were four princes and princesses and four Dlaminis in the Ludzidzimi Council, which advises the Queen Mother. The Border Restoration Committee which exists to try to get South Africa to give some of its territory to King Mswati had three princes and princesses and five Dlaminis among its 14 members.